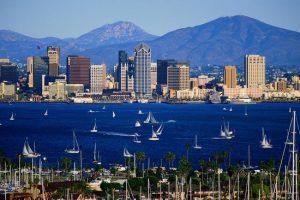 As the state’s second largest, San Diego is one of California’s most important cities, with a population of over 1 million residents. It is comprised of a highly built up urban center and a wide suburban distribution, with surrounding mountain and desert wilderness. These diverse geographic and demographic characteristics make San Diego home to a wide range of potential pest problems. Classified as a ‘semi-arid climate zone’, San Diego is prone to particularly hot summers and very mild winters. While this makes for good year round beach weather, it also creates a sustainable climate for large creepy crawly populations capable of infesting your home. What’s more, the city’s ‘May Gray’/’June Gloom’ period is characterized by a saturation of damp, cool air within a few miles of the coast, making your home a hospitable environment for many different types of bugs and unwanted critters. Some of the more common pest problems in San Diego include termites and other ants, cockroaches, rodents, wasps, spiders, fleas, and ticks. Fleas can be a particularly annoying and troublesome problem for homeowners, and are a notable issue for pet owners. They are known for their incredibly annoying and itchy bites, and are often difficult to detect due to their very small size. Once inside the home, fleas can be very difficult to eradicate effectively. As such, it is generally a good idea to call in the service of an exterminator if flea infestation is suspected in order to thoroughly remove the problem from a home. Although spiders can be relatively harmless and tend to not reproduce in large numbers inside a domicile, some species are particularly poisonous and dangerous to humans. The black widow spider is one spider that can pose such a risk with its toxic bite, and is relatively common in the San Diego area. They can be identified by their shiny black body and red hourglass pattern on the abdomen. Although spiders can be relatively easy to remove from a home, it is advisable to call an exterminator if black widows (or another type of dangerous spider) are found. This can ensure safe removal, and allow the agent to check for signs of spider infestation throughout the residence. As a property owner in San Diego, it is important to remember that pest control is demanded of landlords all throughout the state of California. Tenants should notify their landlords of infestation as soon as possible, preferably by writing. If a landlord fails to remedy the situation in a reasonable period of time after initial notification, the tenant may take steps to repair the condition themselves (provided that the total cost of repair/extermination is not more than one month’s rent). The cost of these repairs may then be deducted from the next month’s rent. One of San Diego’s most renowned pest control companies is Joshua’s Pest Control, which services homes and businesses throughout San Diego County. Joshua’s Pest Control offers many of the typical pest control solutions available for a wide range of extermination needs, as well as 100 percent organic alternatives to traditional pest control methods. Other notable pest control companies in the area include Antac Pest Control, Lloyd Pest & Termite Control and Thrasher Pest Control; however, there are many options available when it comes to San Diego pest control and you should take the time to research the provider that is right for your needs.